The holidays are filled with fun, excitement and much added stress. Allow us to take the hectic and stress off your list this year by having Party Works of Louisville, LLC create a fun and festive setting for your Holiday gatherings! We can use the decorations you already have and design spaces that enhance the atmosphere perfectly! Either way, we show up on time, roll up our sleeves and get to work. Take down service is available as well. We handle re-packing and clean up our work area. 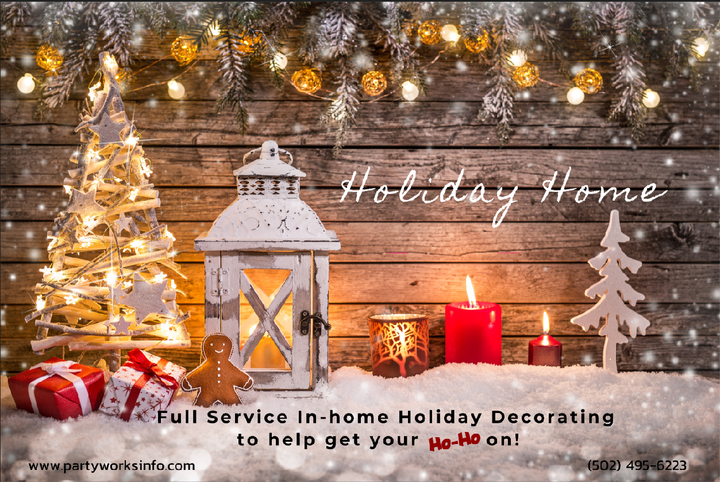 Enjoy more time with you family and friends … leave the decorating to us! Ensuring all is MERRY & BRIGHT! Our On-Site Decorating fees are $65 /man-hour. Most residential work requires either 1 or 2 of our crew to get the job done in a day. We will give you an estimate within 48 hours from our 1st visit and this consultation fee is credited back to you should you decide to work with us.
. . . New in 2018!